We have all been on an e-commerce website at some point within the past few days, it's a way of life we have become accustomed to. With the internet opening up shopping capabilities 24/7, consumers can access your store online globally, opening your business to even more sales! There's no denying that people like to shop whilst on-the-go! Every year, mobile technology is improving and consumers are attached to their devices, therefore ensuring your e-commerce site is mobile ready is a given. Investing in an e-commerce site that is mobile ready is a no-brainer! This should be at the forefront of your mind from the onset. Shopping online can be no walk in the park. Consumers are becoming increasingly concerned with their security. The data that is collected through your website needs to be stored securely and should not be disclosed to any unauthorised people. Taking measures to demonstrate to your visitors that your site is secure and legitimate is important to build up trust. 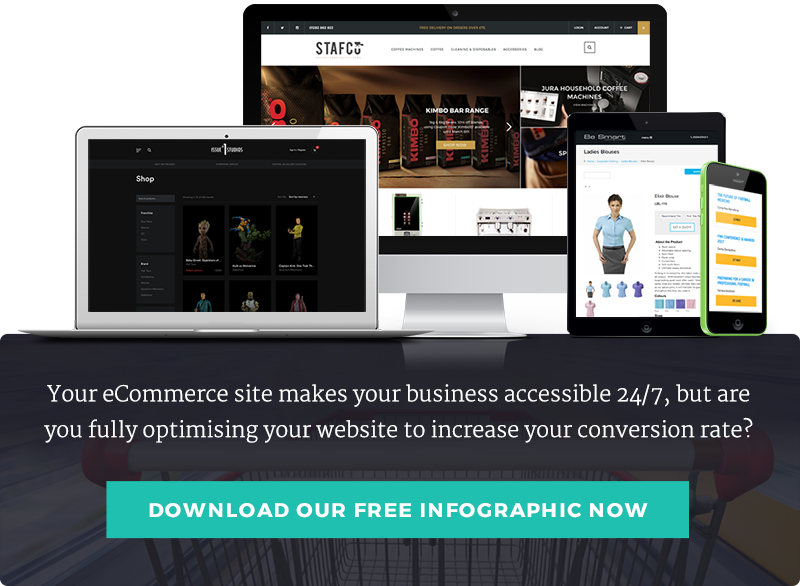 Keeping your website simple will further help your e-commerce site. Having a complicated website means that your consumers will not revisit your site, therefore keeping it simple and easy to follow is really a no brainer. Logging-in and signing-up should be clear, and when going through the stages, your consumers should be guided through the process to ensure they flow through the sales funnel. Having lots of different product images and descriptions is also a key ingredient. The eight-image approach works best, as no one wants to buy something that they cannot see or they have very little information on. Ensure that your customers are better informed whilst they are doing their shopping, increasing the opportunity for better product placement on search engines. Ensuring your site has an easy search tool ensures your consumers can look for one particular item. Scrolling through the whole site looking for one particular item is not an option your consumers want to go down. Filtering your searches can also lead to greater results, therefore incorporate this into your design. This is an area that is debated amongst businesses and web designers. The colours you choose for your website can be a deal breaker. One common mistake that many businesses make is having white text on a black background, this can be difficult to read and can really infuriate your consumers. Make your site easy to read and follow, with images, text and colours that can really complement each of your design choices. We all know that recommendations are key to increasing sales. When consumers are browsing through products on your website, suggest other alternative products that other consumers have recommended. The general rule of thumb here is to include six links that can aid the shopping experience. With this in mind, setting up an e-commerce website for your business can be very lucrative. Not every industry is designed to have such an option, however with more and more industries taking their trading online, implementing the right design features can significantly increase your success through your e-commerce site.